Triola was originally registered in Cowes on the 17th of November 1972 to John Francais Leefer Ludgate, a Sales Manager from Hampshire, only the 50th Albin Ballad to be built of the eventual 1,500 to be produced. Probably due to Mr Ludgate setting up a new business, less than a year later, on October the forth, she changed hands to a Trevor Freeman of Herts, an Architect. During Mr Freemans ownership of Triola, she was featured on the front cover of Yachts and Yachting (I am still hunting for a copy). 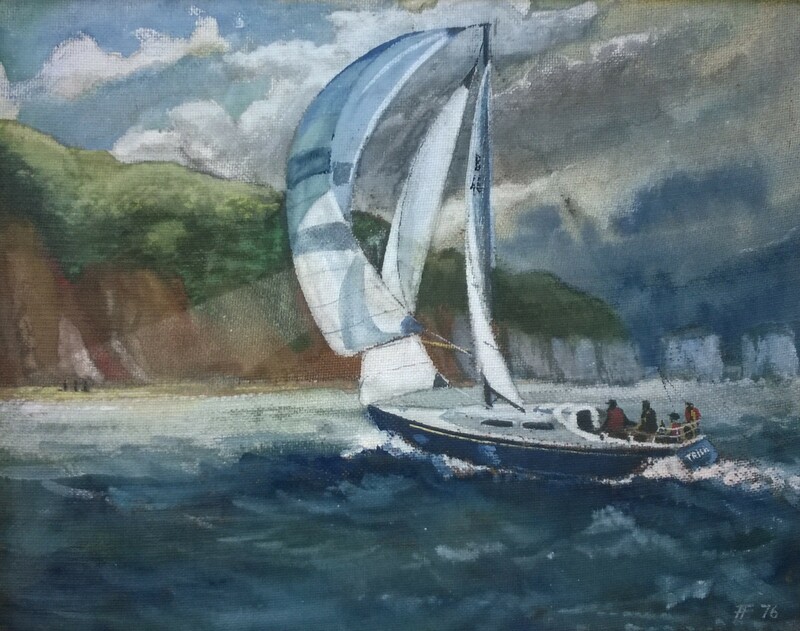 He owned the boat right the way through to the 13th of May 1987, where David Meaning purchased her ’till 1991, where Peter Mumford (of Beken of Cowes no less) purchased her to sail with his family. After Peters family grew up and moved on, Peter had less time to get out sailing on the water as he was too busy photographing others at Beken. When I found her, Triola had been standing for some years unused in a lay up yard a little way up the Medina on the Isle of Wight. 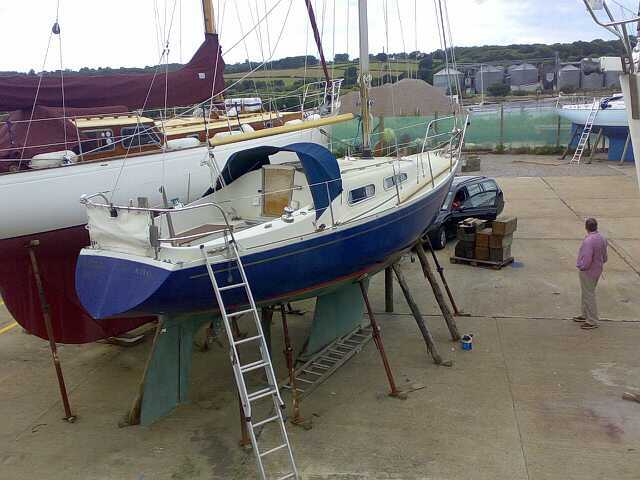 It was clear when she had been in use she had been a much loved and well maintained boat, however the years had taken their toll and she needed to be bought back up to spec. 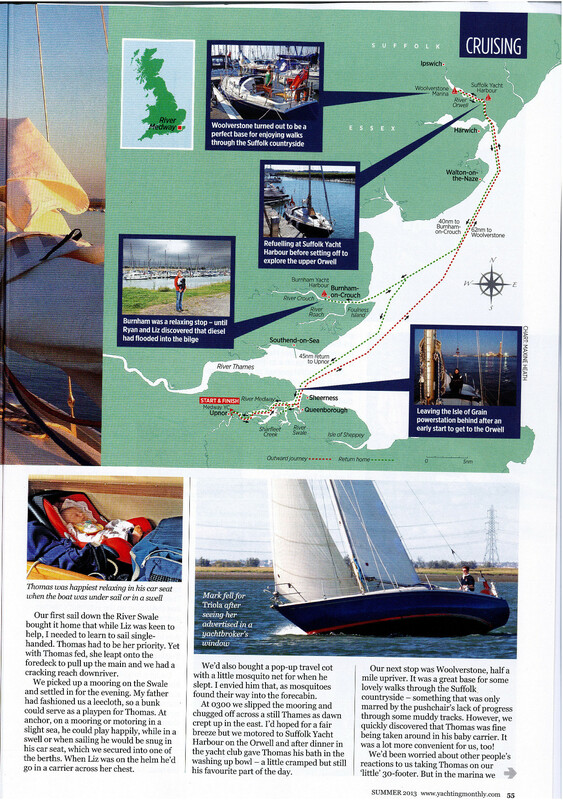 I purchased Triola in 2008 after seeing her in the window of a yacht brokers on that years Round the Island Race in all the atmosphere and buzz of Cowes. I was there crewing on my fathers Harley Mead 35 ft Gaff Cutter Wanda, and after an exhausting and gruelling race (we were short-handed and with just the two of us to sail Wanda it was quite an ask! ), and being shown around her by the broker, I immediately fell in love with her classic sweeping and purposeful lines, as well as her generous living space below. Strictly speaking, I knew I could not afford her, so made a silly offer, which to my shock, excitement (and alarm) was accepted. 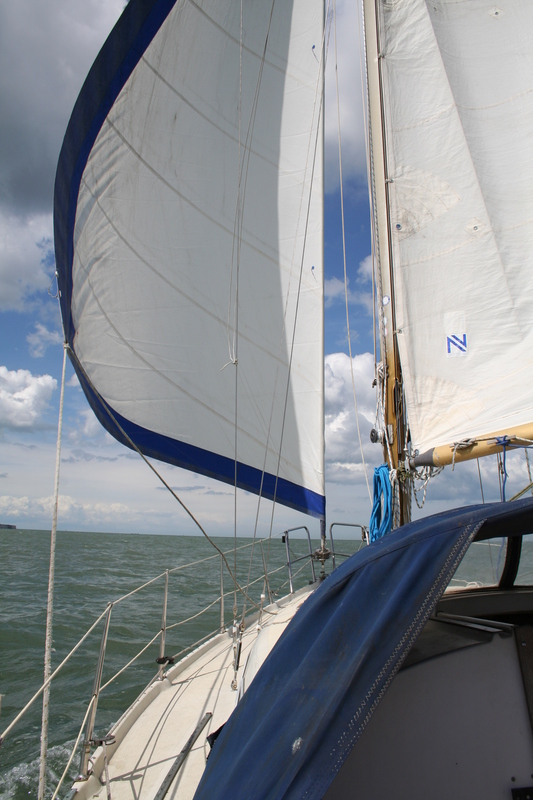 After buying her Cowes in 2009, we did some rudimentary work to update her with a Yeoman Compact plotter, an entry level Garmin GPS and an all important new Jabsco heads and then sailed her back to the Medway in cruise of some 36 hours. Ever since, we have cruised the East Coast, raced a little and prepared to go on adventures further afield. 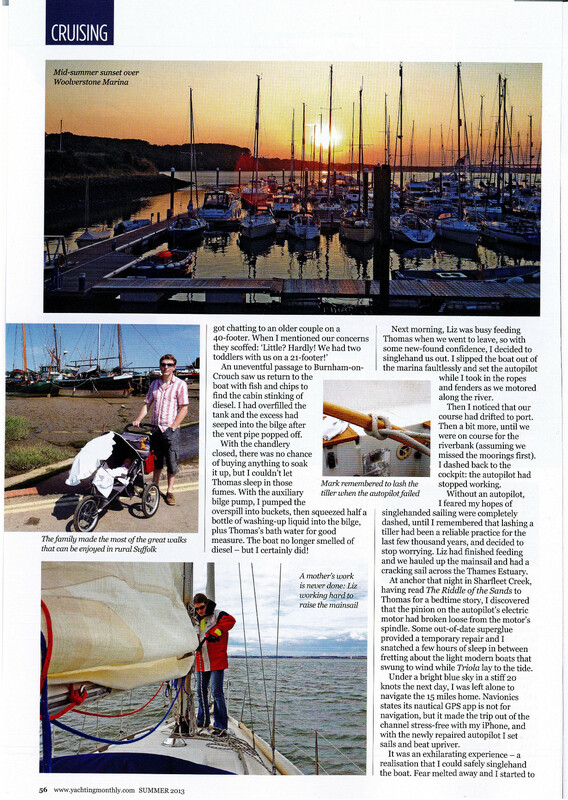 More recently, we took our son away on Triola when he was a mere four months old and then wrote about our adventures in Yachting Monthly. I’m Nicholas Koligiannis. You may remember me from the Ballad Exchange. Ever since its demise/merger I’ve been at a loss on how to post stuff on the Ballad. I used to be a pretty active member and I’ve done several interesting things to Moments of Clarity since. Could you give me some info on how to re-join–if there is such a possibility. P.S. By the way, I read your article on Yachting Monthly–brilliant. P.S. 2 Glad to read you bought a Rocna. So have I and I haven’t regretted it. Indeed, I remember you and your posts well (you helped me on a whole raft of questions, including questions around my mast step). Just head over to http://balladklubben.se/balladexchange and register there. I did toy with the idea adding a forum to this website, I may well still do it to give an alternative place for people to post content. Let me know if you think this is worth doing. How is your Ballad, she is called Tempress isn’t she? Glad you enjoyed the article, I am planning on writing one based on this years similar cruise! Rocna was a cracking buy, true peace of mind! My Ballad is Moments of Clarity, hull no. 334. I had registered about a year ago but I’ve forgotten my password and they can only send my password to my old e-mail address which, unfortunately, is not longer valid. Anyway, I’ll figure something out. In my view the Ballad Exchange was a truly global site and it helped that the official language was English. This is probably what’s missing form the Swedish/Danish/German versions. So, in that sense, it wouldn’t hurt to start something on your site. I did some interesting sailing this summer. In June, I participated in an eleven-day delivery trip from Bangor to Goteborg via the Crinan and Caledonian Canals, in a Jeanneau 49 with two more people on board. And in August, I set off solo for a 25-day, 350-mile circuit of the Cyclades and the Dodecanese with very nice stops at some gorgeous bays. The Rocna is worth its weight in gold. The only time it refused to set was in VERY thick weed–but it would have probably kept me safe as each time I brought it up to re-anchor it surfaced with a sizeable acreage of the bottom attached. Of course, being known for overkill, I also have a 10kg Spade on my stern roller for extra peace of mind (that design is brilliant too). We had looked at lots of boats in varying condition but fell for our Albin Ballad Cracklin Rosie as soon as we stepped aboard. We didn’t really consider how much work was needed (new engine, prop, sails, rigging, electrics etc) but at least we got to choose all the equipment and have really benefitted from the new equipment when cruising and always pushing for the next tidal gate / pub closing time. 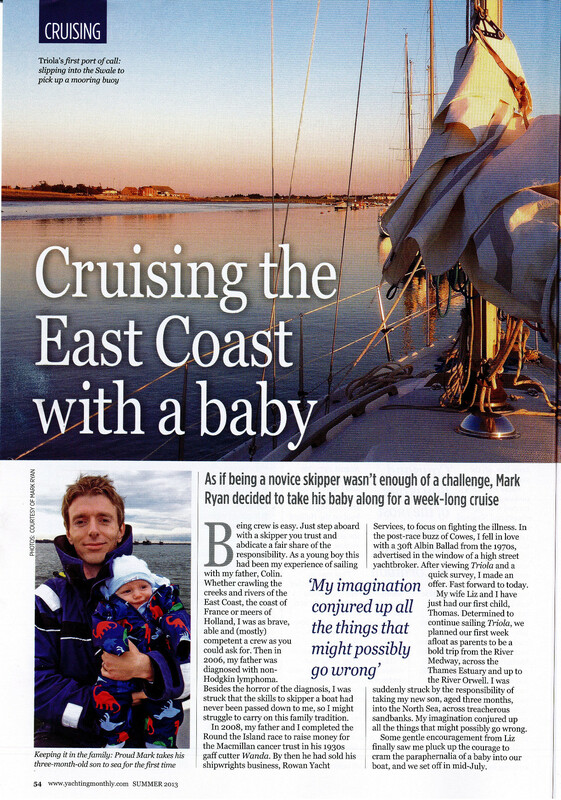 We have managed to cruise between Scotland and Brittany since 2007, and I always find stories of others in Ballads and their journeys inspirational and of practical help. Please continue to post your adventures and we can learn from you. Thanks for your comments. I just googled Cracklin Rosie and came up with your rather splendid round Britain blog that I had hitherto not discovered – what an adventure you had! Our long distance cruising is somewhat curtailed at the moment due to our young son, I’m looking forward to him getting old enough to start pulling some ropes and start getting a bit more involved – next year I tell myself… (he is 19 months now). Where have you been this year? We did the Caledonian canal in 2010 on my fathers boat, a 1930s varnished Gaff Cutter called Wanda – there was an Albin Ballad we bumped into moored on the opposite bank just after we entered the canal from Inverness and I wandered around with my then girlfriend (now wife and mother!) to have a chat with – that wasn’t you was it? I remember meeting someone who had recently bought a Ballad and told me about sailing and racing on the East Coast, including in some high winds. I can’t remember exactly when we had the conversation but I think this must have been you and your wife! Looks like you had a good trip this summer. This year for us work has got in the way of even a couple of weeks of cruising, and our horizons have been very limited. For the next (big) trip I am still dreaming of going North, and my wife is thinking South, so maybe we can compromise by going East. Lots of places to explore in any case. Thank you for your kind words and for looking at my little site. There is no better feeling than that moment when the canvas is up, you turn the engine off and feel the boat accelerate away under sail with just the noise of the water passing the hull (and in most cases the chattering of my two year old son!). If you switch to roller furling, it makes life so much easier, you do lose a lot of sail area compared to the big original number 1 genoa you have (in light airs I do yearn for that big sail area), but in my opinion its worth it when it saves you having to go forward when it gets rough, and single handed that all just gets a bit dangerous. I’ll take some photos next time I visit her (she is out of the water at the moment). I’ve been reading with great interest your many articles on owning and sailing your lovely Ballad since I stumbled across your website whilst researching the design. I am very interested in purchasing a Ballad myself having weighed up the alternatives over the last couple of years (talk about spontaneous…) and am now almost at the stage where I am in a position to make the leap! Saw a lovely example not so long ago and fell in love. Any chance I could drop you an email? Apologies for the delayed reply, I’ve been rather manic at work (leaving not nearly enough time to get down to the boat)! Ballads are fine, strong and pretty boats with a heavy displacement (certainly when compared to modern light displacement stuff), so you never feel exposed or threatened even when the forecast light force 3-4 turns into a tasty 6 to 7 gusting 8. With rolled furling gear she is easily handled by one person (although when manoeuvring it is helpful when my wife can help out / fend off when I sod it up), yet still has plenty of space down below. I wouldn’t worry too much about her being fin keeled, if you do have the misfortune to run aground (which is all part of sailing on the east coast, much as we did on the Deben last year :D), and you dry out, whilst it would be uncomfortable, she would always come back up right again. I’ve been aground a number of times (never dried fully though) and its never been a problem. Also, because she is fin keeled you will sail rings around bilge keeled stuff, and in a bit of a blow, so long as your sails are decent and you have a clean bum (big wetted area below the waterline), you would be surprised what modern stuff you will overtake. I did quite a lot of tweaking with the rig when I got her, raked the mast back a bit more and added a backstay tensioner to her and that made a world of difference to windward. Make sure you pick one up with a decent engine (like mine, a 2GM20 is a good bet), as the costs of getting a new one put in are pretty eye watering, and if I am frank, whilst I have sailed up to a mooring on occasion, I probably rely on the engine more than I should! I’ll drop an email to you, I’d love to chat and happy to answer any questions you have. Hello Dave, thanks for your comments, did you used to own Triola? How long for? What do you sail these days? We have met on the river Orwell and later in Woodbridge. 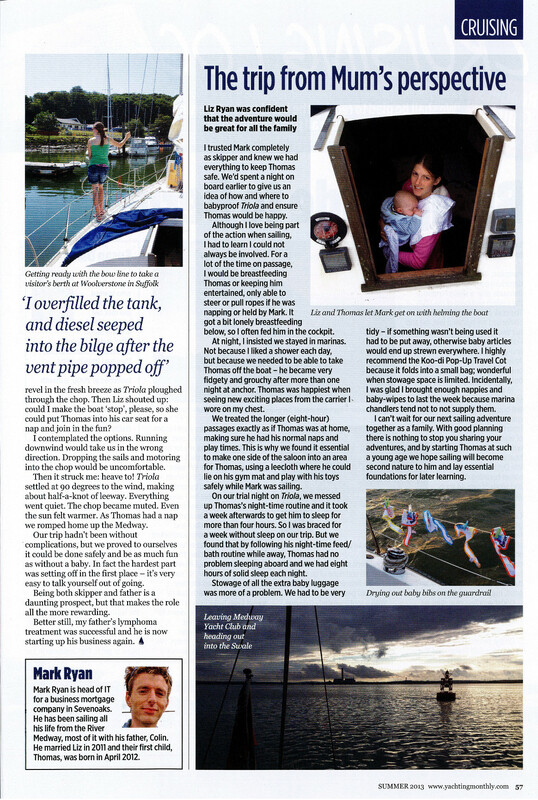 So much fun to read your story in Yachting Monthly! Meeting other Ballads on the way is fascinating, so much enthusiasm in visiting other boats. It was a cracking surprise to see the all too familiar emblem on your mainsail coming up behind us. 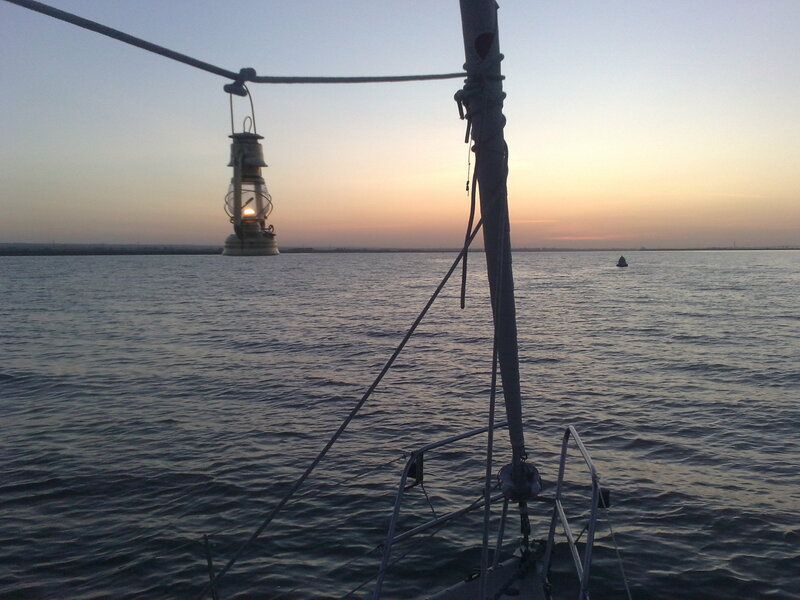 Its great seeing the improvements other skippers have made to their Ballads – it gives you lots of ideas for what the next improvement or project will be. 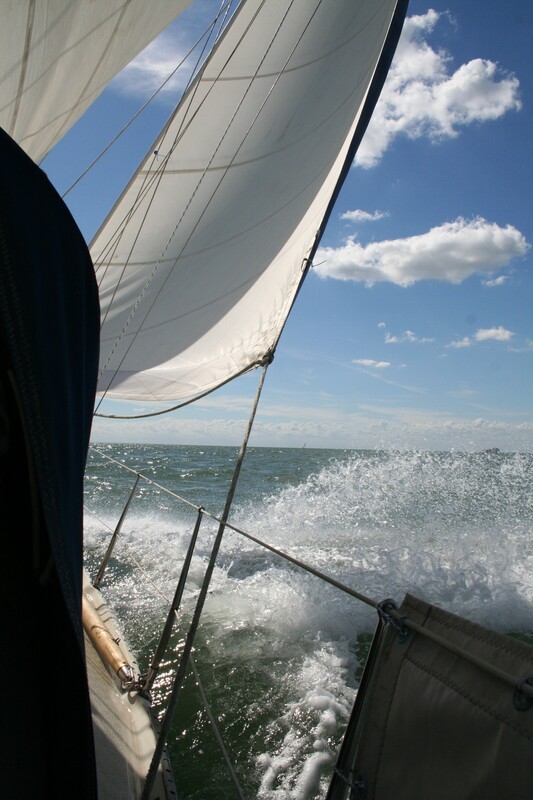 I’d be grateful if you could send any of the photos you took of Triola over – its no often you get pictures of your own boat under sail (even if we did have a reef in for the smaller of our crew members). Hope you are well, are you back in Holland now or still cruising?